Sure, a bowl of Grandma's chicken & dumplings tastes good, but the hefty amounts of fat and calories are less than comforting. SURPRISE! Our version is thick, chunky, and super-satisfying, with dumplings so good, they'll bring a tear to your eye. Try it! To make the stew, bring a very large pot sprayed with nonstick spray to medium-high heat on the stove. Add celery, carrots, onion, and garlic. Stirring often, cook until veggies have slightly softened, 6 - 8 minutes. To the pot, add chicken broth, chicken breasts, mushrooms, thyme, and pepper. Add bay leaf and 2 cups of water. Stir well. Cover pot and bring contents to a boil. Reduce heat to low, and let simmer until chicken is cooked through, about 25 minutes. Carefully remove chicken and transfer to a large bowl. Re-cover the pot, and let contents continue to simmer. Once cool enough to handle, shred chicken with two forks -- one to hold the chicken in place and the other to scrape across the meat and shred it. Add shredded chicken to the pot, along with condensed soup and frozen peas. Stir thoroughly and raise heat to medium low; return stew to a simmer. Meanwhile, in a medium bowl, combine dumpling ingredients. Gently mix just until a soft dough forms; don't overmix. Once stew is simmering, add dough in heaping tablespoons to form about 16 individual dumplings; add the dough slowly and evenly so dumplings don't stick together. Cook until dumplings are firm, 10 - 12 minutes, gently turning them over about halfway through cook time. Remove bay leaf, and serve it up! HG Tip! 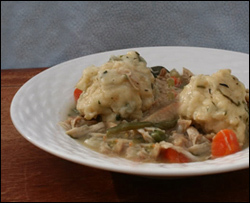 Store leftover stew and dumplings separately to prevent soggy dumplings. Here's the thing about comfort food -- yes, it makes you feel good when you eat it; but more often than not, the feel-good meal comes with a nutritional price tag that no one feels great about. 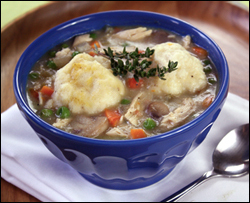 Homemade chicken 'n dumplings is a dish that's delicious and fun to make (dropping dollops of dough into soup = a good time for everyone), but most recipes are far from HG-friendly. Fatty cuts of chicken, heavy cream, butter, too many dense dumplings... It all adds up pretty quickly. Some of the recipes we've seen don't even have many veggies -- for shame! And restaurant versions are just as offensive. Our recipe fixes all the problems. Not only does it include LOTS of vegetables, but our version also has tons of lean chicken and a lightened-up-yet-rich-tasting base, thanks to 98% fat-free cream of chicken condensed soup. And those dumplings? SO tasty and SO fluffy, you'll think a bunch of delicious clouds floated down and sat on top of your stew. So relax; we've got this. Isn't that comforting? This recipe is guaranteed to bring comfort to just about everyone -- click "Send to a Friend" to pass along some cheer!